1) Filling out a form to receive happy mail doesn't give you any rights. I don't have to send you anything when you fill out the form. It's something done with kindness and I hope you will be kind and polite in return. 2) Please don't leave any rude comments, be respectful. 3) You can sign up for happy mail for yourself and for people you like. When you've received something from me you can sign up again. You can request for an unlimited number of people, but keep it reasonable. I will have to spread my gifts between a number of people and don't have unlimited resources. 4) The Happy Mail Project falls under Dutch law. The same goes for all legal matters concerning the project. 5) You are not allowed to use my happy mail project as a method to sell something or to enrich yourself by letting others pay for services that are associated with it without my exclusive permission. This project falls under copyright law. 6) I don't have unlimited money, energy, etc. Please keep that into account when you sign up for happy mail. It's supposed to be fun and friendly, which is how you should approach it. 7) I'm no bank, so won't lend you any money and won't pay your bills. I also won't give you any gift cards on demand (you can of course request them, but you shouldn't force me to send them to you). Please don't make any demands from me and don't pressure me to give you anything as I will cross you off my list instantly if you try. 8) I love to see photos, you would make me happy if you post a photo on social media or if you leave a nice comment. It isn't mandatory, but it would be greatly appreciated. 9) Please use your real name when requesting happy mail. 10) I and the happy mail charity won't accept any form of liability. 11) I'm specifically asking for allergies and preferences, it's your responsibility to share exactly what I should and shouldn't send. 12) Happy mail is a surprise, I won't announce up front that I'm sending it. Please let me know when you receive something, I would love to hear from you. 13) If you have a special request for a person (like someone you know who's really ill), like asking me to send a postcard as part of an event, send me a message on Facebook or Twitter, so I won't miss it. 14) I'd love to hear from you, but please keep in mind that this is a one woman project and I don't have unlimited resources, so if I don't reply straight away it's nothing personal. 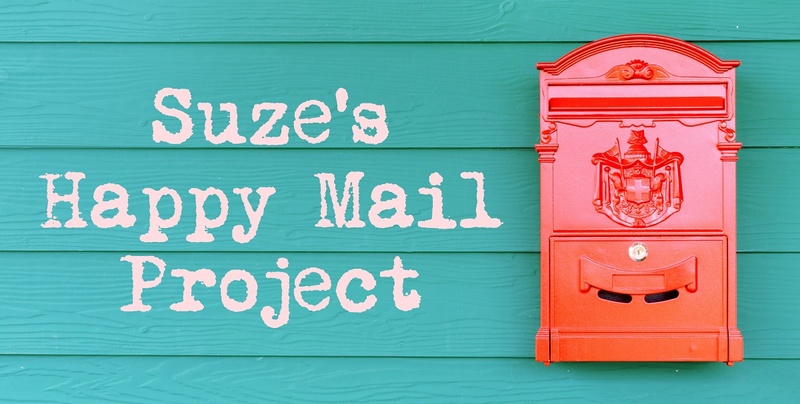 15) Happy mail is a positive project meant to put a smile on someone's face, please treat it accordingly.